Do you have an elongated or sliding glass door that’s next to impossible to find a window covering for? Vertical blinds are the answer to your window problems. Vertical blinds are custom made to accommodate you longer window openings. If you want them installed by a professional, call American Blinds and Shutters Outlet. Paper – The least expensive type, paper is very lightweight and easy to clean. Cane – These are very versatile as they come in two varieties: roll-up & pleated. Canvas – Great for larger picture windows. Canvas has a modern style that pivots the slats. Venetian – Divided up by individual slats, venetian blinds are a great option that’s affordable. If you own blinds but don’t have the money to change the colors of them then this is the easiest way to change the appearance of the room. You won’t spend a small fortune nor will you waste time because American Blinds and Shutters Outlet is always available to assist you. No one wants their widows exposed but we all want window coverings that aren’t boring either. There are lots of styles of verticals that will make that fashion statement that you’re going for so do something about those dull windows today. Our window blinds come in both vinyl and also fabric options. It’s choices like these that make it great to be a homeowner. Blinds can also be colored differently on each side. This will really make your windows stand out. 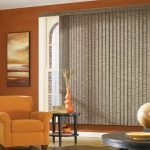 When searching for that ultimate window covering for the sliding glass door, be sure and call American Blinds and Shutters Outlet for options. We have been decorating homes in Orlando for the last 18 years and want to make your windows all that you’re looking for and more. If you are looking for an Orlando vertical blind expert then please call 407-492-1009 or complete our online request form.